Palm pH Meter uses glass or non-glass probes. IQ400 combines pH module with Handspring Visor(TM) and Palm OS(TM) operating system. It features high/low pH level alerts, recalibration alarms, automatic buffer recognition, save/recall of up to 9999 records, and automatic temperature compensation. Data can be gathered and sent to PC, and last 50 calibrations are stored. Digitized handwritten notes and sketches can be saved with pH readings. Cradle allows handheld or benchtop use. This IQ400 pH system combines the convenience of low maintenance stainless steel pH probes with the power of the PDA (personal digital assistant). The system is a pH module coupled with the best selling Handspring Visor(TM) with Palm OS(TM) operating system. Data can be easily gathered and sent to a PC with the push of a button and the last 50 calibrations are stored to keep you compliant with regulations. Features include touch-screen graphics display, pop-up windows and on-screen troubleshooting guides for each function. You can even save digitized handwritten notes and sketches with your pH readings. Other IQ400 features are high/low pH level alerts, recalibration alarms, automatic buffer recognition, save/ recall of up to 9999 records and automatic temperature compensation. 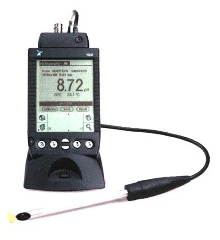 A cradle is included so the IQ400 can be used as either a handheld or bench top pH meter.